Heartbreaking... doesn't feel strong enough. Having been born in the late 80s, I obviously missed teh boat in reading original Silver Age Marvel.. Still, everyone knew Marvel comics as we knew it started with Stan. I finally got a chance to read them in my teenage years, when Marvel got serious about its reprinting again. Many people say that it is good for its time, or good for what it is. I disagree, it is great period. Yes, some of the plots could get hokey, but those characters were real. You felt them. You knew them. You cared for them. That is why it can feel so shocking that a man I met, but never knew, has passed. He gave me some of the best companions anyone would want. And what wonderfully complex companions they were. People say that real, deep and complex characters started in teh 80s. Alan Moore even said Stan Lee created two dimensional characters at best. Well, with absolutely no respect to that statement, I disagree, Captain America pondering the nature of his fight, Spider-man worrying about every aspect while being a saint and self-absorbed in the same issue, Silver Surfer trying to contemplate why humans are so terrible and yet good, these are well rounded characters. Yes Jack Kirby and Joe Simon crated Captain America, and no on can or should take that away, but Stan brought him to the state we know him. All those paths Alan Moore loves to tread, about the nature of society and the complexity of people, Stan did it first. And while tying to appeal to kids and teens. I actually had been thinking this weekend, I swear to God this is true, about Stan Lee as a sort of Charles Dickens of comics. They both loved to write bigger than life characters who were also painfully human. He knew people. And in the end, that was his superpower, he understood people. That is why the characters he worked on jumped off the page. People have worked to give Kirby and Ditko more credit recent years. A worthwhile goal (which Stan participated in), but too often it turned into a hit job, claiming Stan was little more than a thief. All you have to do is look at Kirby and Ditko's solo work. it was good, it was powerful, but neither one could write dialogue to save their life. in both cases it always felt stilted and almost wrong. Kirby I think knew this, and that is why he hired someone else to write the dialogue for Sky Masters. Those Marvel characters felt real because of Stan Lee. I... we all felt like we knew them, like they could be real, because of Stan. It also aided him as an editor. He found great talent, and could foster it because of that ability to know people. 1. He introduced Black Panther in 1966 and the Falcon (Alongside THE American superhero) in 1969. Even if that was solely Kirby and Colan's idea (which I do not for one second believe it was SOLELY), he was still the editor. He took the risk of introducing these characters into a world where racial tensions were high. We take black main characters for granted now (which is probably a good thing) but back then it was a brave choice to send that to newsstands across the country. Often too kids, and who knows what some of their parents may have said at the time. 2. Bill Everett. Everett was a tragic figure. But Lee always found work for him. Whenever it was needed, Everett could count on Lee to deliver something for him. A good editor takes care of his people. It is just so incredibly sad that the last year (years?) of his life were so terrible. He was still an employee of Disney/Marvel, why didn't they intervene? Thank you Stan Lee. Thank you for creating and working on some of the finest characters ever, and giving me some great firends. Thank you for getting the ball rolling so I could met up with some of the best real world friends anyone could want, as we bonded over the comic industry you revolutionized. I just hope he knew how powerful his impact was, and that it didn't take his works being turned into movies for it to matter. I'm glad I got to meet him.... even if just at teh end of a line, and just long enough to ask him his favorite Marx Brothers movies, and wish him well. Stan Lee is dead. But he isn't gone. He is no longer the living legend we all called him. He is just a legend. And legends never die. And I urge everyone to go back and read some of those old comics of his. They are still vibrant. The characters are still real and believable. Stan Lee still matters.... and he always will. Hopefully he had even the slightest inkling of how much he meant to so many. "Still vibrant...still real and believable." And they will be for many, many years to come. I apologize, nbut I have a bit more to say. Stanb Lee did to incredibly unique and powerful things with teh Marvel Universe. First he made it teh most popular ocomic universe, but it still seemed the subversive one. There have only been a few points since 1970 that DC outsold Marvel regular, bu they still feel like teh establishment. Marvel at its best, seems almost subversive compare to most superheroes. And that was all Stan. The most by the book Spider-man story will feel that way, because Stan's characters were so removed from the traditional superhero, despite the fact by all logic he should have created the new traditional superhero. But he never did. Marvel might outsell Superman often, but it always feels to be rebelling against the man of steel somehow. Which leads to teh next point. Again. MArvel is THE comic company. But it feels so p[ersonal. Stan Lee crafted a world that feels like it is just for you. You feel like Spider-man is your friend.... not just some corporate mascot. When done right, it all feels so personal. Maybe because comics are still loked down on, and the properties have only been big for a decade, but the characters feel like some little band only you really care about. Like no one else gets i quite like you. Then you go out, see a million Spider-man shirts, and yu are like, "oh yeah, this is a multi-billion dollar character." Superman doesn't have that, Batman doesn't, Mickey Mouse doesn't, not even the Looney Toons have it. Stan was also maybe the only person who could crate a character to be an obstacle (Mary Jane Watson-PArker), and write her so interesting that she became the love interest. And that is an important point. Conway said Making MJ the lead was Stan going with what the fans wanted That he hated disappointing the fans. He was really the first comic guy to court this strange thing called fandom. To try and connect to them. To make them part of the world he created. To make it a community. He loved the fans, I just hope he knew how much we loved him. HE wanted to the fans to be happy so much, that after he changed the newspaper strip to reflect Pete and MJ no longer being married in the comic, he read the winds and changed it right back. Some might say that shows a lack of artistic integrity, or not being able to stick to your guns. I think it was him being appreciative of the people who gave him decades of adoration. And that is sort of it. Stan laid the seeds, that we all kind of feel like we own the Marvelcharacters too. Like they are a part of us. That everyone who ever bought a comic owns a little piece of those characters. And yes, there have been times were that backfired, and fan have gotten weird. But come... isn't that a really col thing? Isn't it more good than ill? Peter PArker feels like a friend (and that feels incredibly nerdy to say). and I have plenty of real life friends, so it isn't JUST being a dork. But other people have that same connection. -The Golden Age gave us heroes we could believe in, Stan gave us heroes we could believe. -HE showed that even heroes can have feet of clay, and that even Captain America can be neurotic and marose, but it only makes their heroism shine brighter. -Because of Stan, we saw ourselves in our heroes, and it made us think we could be that good. I love the idea of Stan's death being a huge comic book fake-out, Jack. Next summer, he'll come crashing through the walls of the San Diego con shouting, "I'm back!" Stan Lee created my favorite comic book character, Spider-Man, for which I'm eternally grateful. Of all the fictional characters in all the fictional universes, Peter Parker feels the most real, a testament to not only Lee's skill but his authenticity. Very true, David. It's clear that Stan really believed in Peter and, in turn, we all believed in him, too. "And that is sort of it. Stan laid the seeds, that we all kind of feel like we own the Marvelcharacters too. Like they are a part of us. But other people have that same connection." Well said, Jack. I agree completely. I'm sorry Dematteis, but I have more praise to give Stan Lee. If you look at Silver Age Marvel, the popularity of a book was usually directly proportional to how long Stan was on the book. Spider-Man was the most popular, and had the longest Stan Lee run. and finally Daredevil (just shy of 50 issues) and X-Men (didn't even make it to 20. In essence, I think that is why Daredevil continued and X-Men was cancelled. Daredevil, for all teh jokes about teh comic in the 60s, was a well defined character. Mat Murtdock had 50 issues of Stan crafting him and working on him. Even the much criticized "fake twin story" is good character work. Yeah, I am sticking up for the Mike Murdock Saga. It explored who Matt was. It actually got heavy at time, with Matt feeling most free as his win, while having to lie to those closest to him. And anyone who doesn't feel something when they read DD # 47 "Brother, Take my Hand," might be a Vulcan. X-Men however... well, for the first few issues they were in a sort of disorganization. He didn't know who they were. Beast actually came off more like the Thing. Then, he was gone. Sure, all the basics were there. Especially Xavier (being shown as a bit of a jerk at times, which Claremont ran with). They are Stan Lee characters through and through. They remained the building blocks for everything done with the characters and the concept ever since. They just aren't fully formed. Ye, I know I skipped some books, but the Nick Fury books are a bit different in genre, and Silver Surfer is a cult classic and fittingly makes it walk the line. 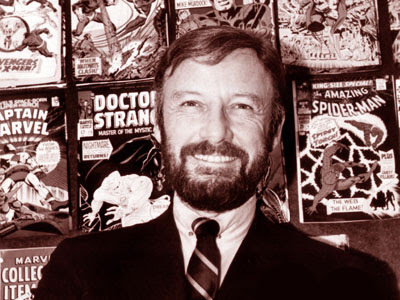 Stan did every issue, of its 18 issues. And those who liked it loved it. Those who didn't thought it was okay. There are two characters Stan Lee worked on that have not gotten enough love this week, Captain America and Sub-Mariner, which are neglected because Stan did not create either. Let's be honest though, he deserves some accolades there as well. Depending on ho tyuo ask Denny O'Neil or Frank Miller saved BAtman. They took them from the sort of 2d character he had become, and forced hm into being something more. Lets be honest, Denny O'Neil created the Batman of 1971-2000, and Batman the Animated series, and Batman Begins. However, there would be no Batman to save without Kane and Finger and Robinson. Much is the same for Captain America. Kirby and Simon created Captain America. The icon. No one can or shouyld take that away. It is the highest of achievements for the character. Stan, though... He did to Cap what O'Neil did to Batman over half a decade earlier. From Avengers #4 on, Cap was tehCAp we all know and love. Reflective. Interspective. Concentrating on jsut what he means as a symbol of America and herosim. He even had a vbit of what we might now call PTSD afer Bucky. Stan made Cap a modern Hamlet of sorts. HE turned cap into, not an introvert, but a man with a deep inner thought process. Stan us Cap to show us the price of being the greatest hero. He was fearful of losing, playing at high stakes. He was dogged by if he were doing the right thing. He had regrets, and problems with work life balance he lamented. The first five pages of Captain America #122 are some of the best Captain America ever. "Maybe I should have battled less and questioned more." That is great. Simon and Kirby created Cap, no one can or should take that away. But Stan made him the character that has endured past WWII. Stan Lee brought him back, first as a menace, then as a hero. Most importantly, in both it was loyal to Bill Everett's idea. Namor was a noble villain when playing the black hat, and when he switched to white he was a moody anti-hero. It would have been easy to just make him a villain, but Stan kept him sympathetic, and complex. He may have done bad, but you understood why even while not condoning. Most importantly, and too often forgotten, despite having a liked team, and despite Evrett being an alcaholic who chronically missed deadlines, Stan let him back on teh book. It is a great run first of all. More importantly, Stan made an executive decision, that allowed Everett to spend his last days scripting the character he created decades earlier. And Everett did what he always said he wanted to, he expanded and deepened Namor and Atlantis. He enriched it. Stan lee took a chance on friend or co-worker, or something, and let him have his final say. And finally, the Beatles comparison. Many people like to compare the Marvel bullpen of the 60s to The Beatles. I believe this greatly devalues Stan Lee, and the 60s Marvel crew. They did far more for comics than the Beatles did for music. That era of Marvel was like the Beatles, Rolling Stones, the Yardbirds, Aretha Franklin, Jimi Hendrix, and more. Lee pushed the comics medium to go deeper. To have characters that did more than just save the day, but be human as well. DC started to head in that direction. Setting up new possibilities for characters old and new, and forming deep connections in that company as well. While MAvrel and C both did some fad chasing in the 70s, the superheroes stayed as a permanent fixture. And anchor, because of the connections people ha to them. Without the Marvel revolution, superheroes probably would have been dropped by the remaining companies when Horror (And martial arts and what have you) rose in the 70s. Then, without the superhero staple, the comic industry probably would have conked out in the overly saturated 80s (of course Jim Shooter certainly deserves dome credit there, but there would be no Marvel for him to steer without Stan Lee). And while many musicians can be traced back to the Beatles these days, EVERY writing in comics can have a direct line of influence back to Stan Lee. Stan Lee always said that he wanted to create the great American novel, which is defined as a novel that shows perfectly what it is to be an American in that time period. 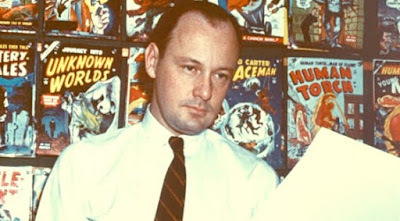 When he revolutionized MArvel, and the way he co-created those characters, and how many there were, and given the serialized nature, he did so much more. They can go on to show what it is like to be an American in EVERY time. it may have been the GREATEST American novel, as long as it is used properly. But most importantly, a year or two ago, a guy at my local comic shop made a statement of belief. He believes that the reason Stan Lee got dismissed as a thief is because Jack Kirby died first. Giving some wight to him as a legendary figure, and perhaps as a victim (in converse to lee's iconic status which only grew in the 2000s). Maybe that is true, maybe that is why so many people turned againsdt Stan, shoosing to believe it was ALL Kirby, and not collaborative. 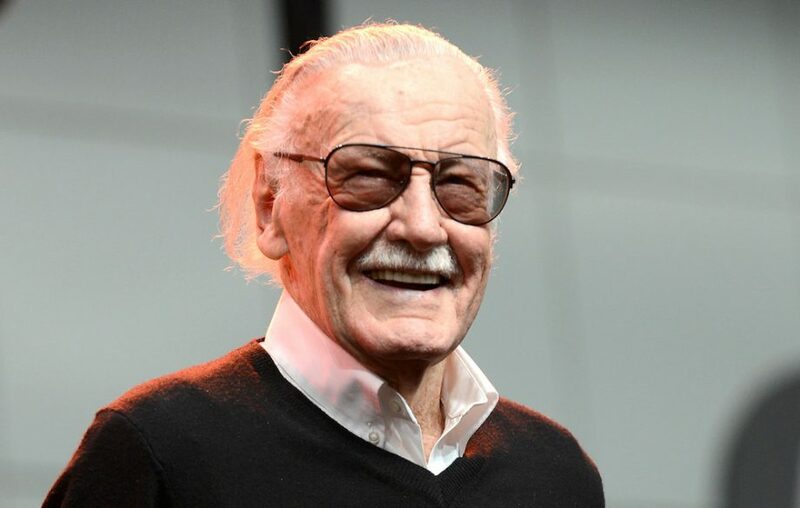 So, if something good can come from Stan's passing, aside from his pain being over, it is that we can all look at it clearly, and say it was collaborative. The magic of Marvel was a group effort, lead by Stan sure, but a group effort. A group that is now sadly all gone. I get the similarities to Dickens, of course: Both were writing in installments, to a deadline, trying to feed their families and keep the wolves at bay, turning out wonderful work under stressful circumstances. Dickens of course was writing novels: finite tales with beginnings, middles and ends. There was no DCU (David Copperfield universe). No, Stan didn't write the great American novel, he and Jack and Steve went bigger and better: they created their own universe, one that continues to live and breathe and evolve even after they're gone. What an achievement! There is no proof David Copperfield doesn't take place in the same reality as Oliver Twist. Interestingly, Stan's writing is still going on... I think. The Spider-man newspaper strip is still being published, and it was always said he was still writing it. Of course, what that means is up to some scrutiny. I always figured he talked with the artist (Alex Saviuk currently) and then he would do a thing with it. But he had enough control to mack Marvel undoing the marriage in 2008... and then bring it back in 2009. As far as I know he had enough orf a "writer credit"
to never have it challenged. I don't know how long it takes to get the strips ready in advance of printing. But everyone knows Stan Lee is dead, and there is yet to be a memorium strip. And I assume that would come. Interestingly, if this is the case, fate may have allowed Stan to give Pete a happy ending. Just before he died, the strip had Pete hearing MJ was coming home, very anxious for him. And the day Lee died, JJJ got Luke Cage to try to hire Luke Cage to go after Spidey... only to be told by Cage Spider-Man isn't guilty of anything. It is possible when all is said and done Stan's last say in comics could be Peter PArker happy with his wife, and the world accepting he is a gero. I just want to add, the past week has been a solemn one for comic readers, no doubt. It is no secret that tensions have been running high in that world for a while now. Back and forth criticisms and anger, even hate. Sometimes fair, sometimes not, but never deserving of "the H-word." This week saw so many fans pouring out love for Stan Lee. All those aggravations were, not gone, but put on the back burner. We became what comics were once, a group of people with a common passion. We all missed Stan Lee. We all were grateful for what he gave us. We saw that bigger picture. That was Stan Lee's final gift to his fans. This week, we were all just fans in shock. You're absolutely right, Jack. Our grief, and our love for Stan, brought the whole community together. Re: the newspaper strip. I forget where I read it, but in one of the many articles I came across last week, it was mentioned that, despite his name in the credits, Stan wasn't writing that strip anymore. They said who was, but I've forgotten! That isn't really uncommon with newspaper strips. There are several strips that do that. There also those who don't. I suppose that is something I suspected to some degree, even if I didn't want to face that fact. Did the article say when he stopped? Just wondering if it included the marriage strip. i know he suggested the idea to Shooter, and and matched it. I guess more than that, I want to know if he wrote the ones I read as a kid on Saturday morning. I will, say this, as some one who has been reading the classic newspaper steeps in book form (very early, definitely still Stan.) I would say they are worth taking a look. I think it was Roy Thomas who was mentioned as either writing or plotting the strip recently. But don't quote me. And I believe others have been plotting the strip for many years now. I don't know how long Stan continued scripting the strip, and it would be interesting to know.